Home Tags Posts tagged with "shasta fire"
Two firefighters have been killed and tens of thousands of people forced to flee their homes in a raging wildfire in Shasta county, northern California. According to fire officials, the fires are being sucked up by strong winds to form “fire tornados” that are uprooting trees and overturning cars. The fires have destroyed at least 500 structures and are threatening thousands of homes. Firefighters are battling the blaze, which is only 5% contained so far. The wildfire, which has been named the Carr fire, began on July 23 and has scorched over 48,000 acres of land – an area larger than the city of San Francisco. Cal Fire Chief Ken Pimlott told reporters: “We are seeing fire whirls – literally what can be described as a tornado. “This fire was whipped up into a whirlwind of activity” by gale-force winds, he said, “uprooting trees, moving vehicles, moving parts of roadways. Two firefighters – fire inspector Jeremy Stoke, and a bulldozer operator who has not yet been named, died trying contain the blaze. According to the San Francisco Chronicle, three people – a great-grandmother and her two great-grandchildren, are currently missing. About 37,000 residents have been forced to leave the area. 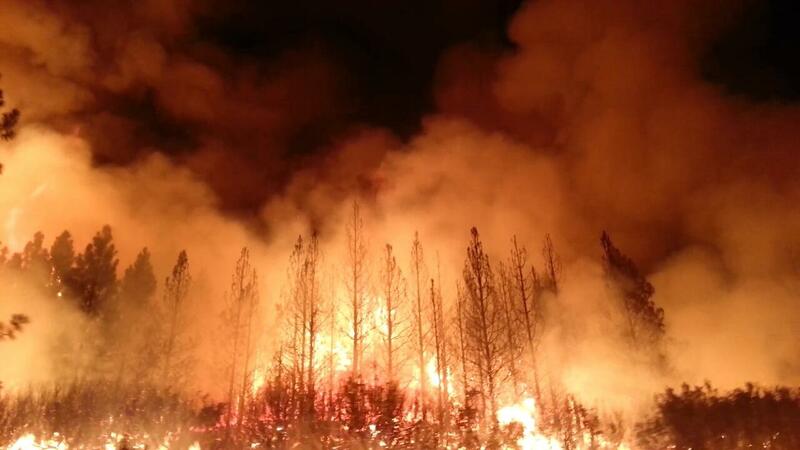 Wildfires are a common occurrence in California during the state’s long, hot, dry summers. However, experts say this has been the worst start to the fire season in 10 years – partly due to the 2012-2017 drought that killed off large amounts of vegetation. In December, California Governor Jerry Brown said devastating wildfires fuelled by climate change had become “the new normal”, and that large fires “could happen every year or every few years”.